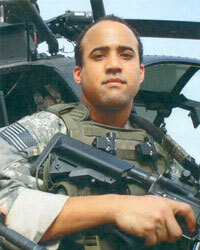 He was killed during a direct fire engagement by a heavily armed enemy combatant in northern Iraq on January 6, 2009. The enemy combatant was subsequently killed when he engaged the assault force. SSG Davis was serving his sixth combat deployment with the 1st Ranger Battalion. His previous. deployments were to Afghanistan and Iraq. After graduating from Seabreeze High School in his hometown of Daytona Beach, Florida, SSG Davis enlisted in the Army in October 2000. He completed One Station Unit Training at Fort Benning Ga., as an Infantryman. After graduating from the Basic Airborne Course there, he was assigned to the Ranger Indoctrination Program also at Fort Benning. He graduated from the Ranger Indoctrination Program in June 2001 and was then assigned to Company C, 1st Battalion, 75th Ranger Regiment in July 2001. He served in multiple duty positions while assigned to 1st Battalion. His military education includes the Basic Airborne Course, Ranger Indoctrination Program, Warrior Leader Course, Combat Life Savers Course, and the U.S. Army Ranger School. SSG Davis' awards and decorations include the Bronze Star, Meritorious Service Medal, Purple Heart, Joint Commendation Service Medal, Army Commendation Medal, Army Achievement Medal (10LC), two Army Good Conduct Medals, National Defense Service Medal, Afghanistan Campaign Medal, Iraq Campaign Medal, Global War on Terrorism Expeditionary Medal, Global War on Terrorism Service Medal, NCO Professional Development Ribbon, Army Service Ribbon, Combat Infantryman Badge, Expert Infantryman Badge, Parachutist Badge and the Ranger Tab. Davis is survived by his mother Ellen Davis, of Fayetteville, N.C.; and his stepfather, Nelson Buckwald of Daytona Beach; his sister, Staff Sgt. Nakischa Davis of Fayetteville, N.C.; and, his niece, Ariana, also of Fayetteville.